Protein oxidation is at the core of the aging process. Setting forth a variety of new methods and approaches, this book helps researchers conveniently by exploring the aging process and developing more effective therapies to prevent or treat age-related diseases. 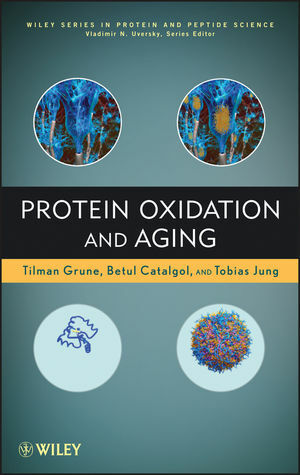 There have been many studies dedicated to the relationship between protein oxidation and age-related pathology; now it is possible for researchers and readers to learn new techniques as utilizing protein oxidation products as biomarkers for aging. References at the end of each chapter serve as a gateway to the growing body of original research studies and reviews in the field. TILMAN GRUNE, MD, is Full Professor and Director of the Institute of Nutrition at Friedrich Schiller University Jena. His research examines the biological phenomenon of oxidative stress. In particular, his research group has been investigating the oxidative stress response of cells and organisms and the protective influence of antioxidants. BETUL CATALGOL, MD, is Assistant Professor in the Faculty of Medicine and the Department of Biochemistry at Marmara University. She is coauthor of Proteasome and Neurodegenerative Diseases, Proteasome and Cancer, and Protein Carbonyl Measurement by Enzyme-Linked Immunosorbent Assay. TOBIAS JUNG, PhD, is a Research Assistant at Friedrich Schiller University Jena. He is coauthor of Structure of the Proteasome.